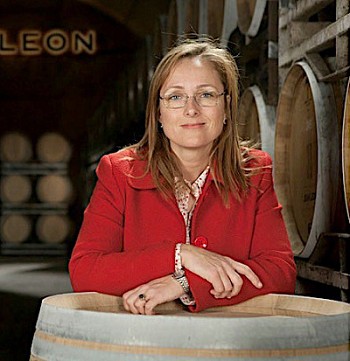 We study the career paths of winemakers who are women. Still today, winemaking remains a traditional male-dominated field regardless of the country, although this situation is slowly changing. Describing the career paths of current women winemakers can facilitate this process of change by illuminating the presence of successful women winemakers and providing road maps for those who wish to pursue a career in viticulture and enology. We began by studying the career paths of U.S. winemakers who are women, mostly in California (CA Women Winemakers) We have extended this research to winemakers in Spain. We were extremely fortunate to be able to schedule winery visits and conversations with a number of winemakers we identified through our research. Our first conversations in Spain were with women winemakers in the Rioja wine region in July 2014 (see Rioja). 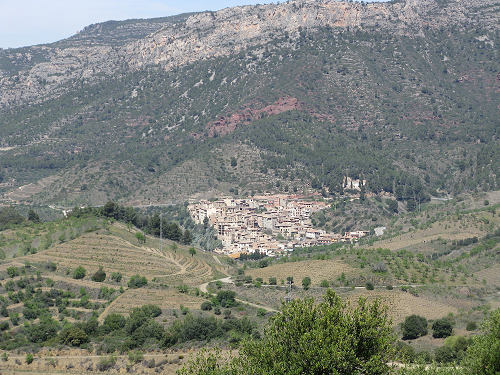 We then met with winemakers in the Penedès (see Penedès), and now the Priorat, both located in Catalonia. The hauntingly beautiful Priorat region is located in the south of Catalonia in the province of Tarragona. Sheer and jagged peaks of rocks, steep mountain slopes, and crushed-slate stone outcroppings characterize its landscape; small villages are somehow gracefully nestled in this challenging environment. Needless to say, the semi-arid nature of the region adds to the challenges faced by its flora and fauna. We stayed at a small hotel just outside the centuries-old village of Gratallops, population 250, located in the heart of the Priorat. The village was relatively close to the wineries that we had arranged well in advance to visit. 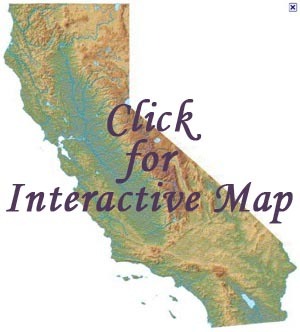 The "short" distances indicated on our map turned out to be deceptive, however. The roads through the mountains are quite steep and very winding, and we were late (or lost) on more than one occasion! All the wineries are located in small villages not unlike the village of La Vilella Baixa pictured in the introductory photo. We were warmly welcomed at each and every visit, and the conversations we had were heart-felt, authentic, and informative. The winemakers ranged from "famous" to "rising stars," and all of them were inspiring, talented, hard-working, proud of their wine region, and completely in love with what they do. In short, as a group they were simply awesome. We first met with Daphne Glorian-Solomon, the winemaker and proprietor at Clos Erasmus, and one of the founders of the "reawakened" Priorat wine region. Our second visit was with Sandra Doix Mora at Mas Doix, a family winery with a long history of grape growing. This was followed by visits with Isabel Fortuny at Ferrer-Bobet, a relatively new winery that had its first vintage in 2005, and with Maria Sangenís at Sangenís i Vaqué, a family winery using traditional methods. We next visited Torres Priorat, a project under the direction of Mireia Torres Maczassek, whom we had met on our earlier visit to the Penedès region. We ended our week with a visit to the Raimat, a model agricultural estate, where we met with Pilar Salillas. 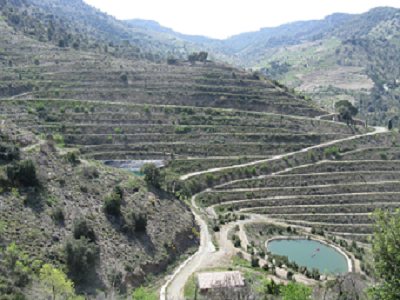 The Priorat has quite recently experienced a significant reawakening as a wine region. 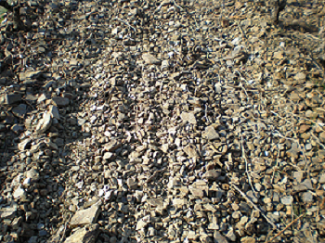 This rebirth was led by a Catalan winemaker, René Barbier, who understood the region's unique slate soils, locally known as llicorella (see photo), and the intense, full-bodied red wines they could produce. Alongside the indigenous Garnacha (also known as Garnatxa or Grenache) and Cariñena (or Carignane), a number of Priorat winemakers are using other varietals such as Merlot, Syrah, and Cabernet Sauvignon for their red wines. The region's white wines are made from the four authorized white varietals, Garnacha Blanca, Macabeo, Pedro Ximenez, and Chenin Blanc. Our visits with winemakers took place at wineries having annual productions ranging from well over one million bottles to fewer than 20,000. All the wineries were located in small villages. Being adventuresome led her to the Priorat. The morning we met with Daphne Glorian-Solomon of Clos Erasmus, just outside of Gratallops, she was scheduled to be off to Paris in a few hours. She travels a great deal, we learned later, so we were pleased and grateful to be able to meet with her, albeit relatively briefly. She hosted us at her comfortable home, and we soon felt like we were talking with an old friend. Winemaking was not an intentional career path for Daphne, who is French by birth and grew up in Switzerland. She trained as a lawyer and received her degree from the University of Paris in the mid-1980s when she was in her early twenties. As fate would have it, she was offered an intriguing job before she could begin practicing law. A noted English wine merchant living in Paris hired her to look after things while he went off to New Zealand to get married. He also asked her to select wines in Burgundy for his customers. Daphne found "that she loved it." She was "tasting all the time and totally enjoying being in the wineries." A few years later, Daphne met René Barbier, the aforementioned Catalan winemaker, at a fair and he told her about his vision for a new project in the Priorat, a historic wine region that was virtually unknown at the time. René had been selling his grapes to the coop and wanted to begin making wine from his grapes. He approached friends to buy their own plots of land, with the goal of building a winery where they all could share the space and craft their own wines under the same roof. Daphne and three other friends joined in with René on the project. She stayed at René's project until 2000 but with productions increasing, "the winery was bursting at the seams," and she decided to "go it alone." Starting Clos Erasmus with two hectares of vineyards in 1989, Daphne slowly added additional plots to reach 10 hectares in 2004. She planted Cabernet Sauvignon, Syrah, and Grenache vines to complement the existing old-vine Grenache plantings and farmed them bio-dynamically. She basically learned her winemaking "on the job" under the guidance of René and others. To quote Daphne, "I was not ambitious, I wanted fun. If you are not afraid of competing, you can do your own thing." Daphne crafts two wines: Clos Erasmus, her flagship wine, and Laurel, a softer, lighter wine. Clos Erasmus was awarded 100 Parker points for the 2004 and 2005 vintages, and brought a good deal of attention to the wines of the Priorat. The recognition also established Daphne's reputation as a leading winemaker in Spain and internationally. Her winery's current production is 2000 12-bottle cases - 250 cases of Erasmus and the rest being Laurel. American importer Eric Solomon, the owner of European Cellars located in North Carolina, tasted the first vintage of Clos Erasmus in 1990, and contacted Daphne immediately to purchase all that was still available! Little did she know that this interest would lead to their meeting in person a few years later and then marrying in 1997. Daphne now lives in North Carolina several months of the year. As she rushed out of the door to catch her plane, Daphne gave us the two opened bottles of her wine we had been tasting - the 2012 Clos Erasmus and the 2012 Laurel. They had been opened for wine writers from the Wine Advocate and Wine Spectator who had been visiting earlier that morning. It was fortuitous timing for us because both wines were delectable! We hope to connect with Daphne the next time she is in California and promised to introduce her to some winemakers whom she doesn't know. Watching her parents, who are her role models, "led her to love wine." Mas Doix is a small family-run winery in Poboleda that was established in 1998. It builds on a family winegrowing tradition that goes back to the 1850s, with its current vineyards planted by the family in 1902. Our meeting early on a Friday morning at the family-owned winery was literally a meeting across generations. 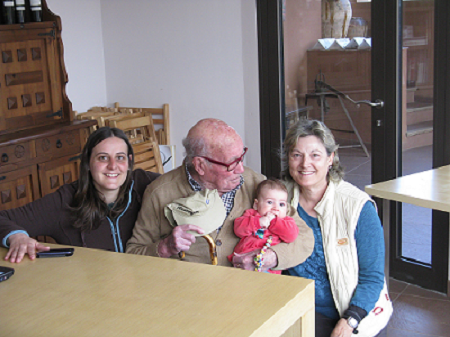 We not only met with Sandra Doix Nora, the winemaker and her mother, Maite Mora Pamies, the viticulturist, but we also were joined part of the time by Sandra's paternal grandfather, the former viticulturist who had taught Maite her exacting craft. And for a short time, Sandra's 4-month-old daughter Martina was part of the conversation. The story of Mas Doix wines begins with the year 1997. This was the year that Sandra's paternal grandfather had decided to retire and wanted to rent the family vines. Sandra's father, who had his own business, suggested that they try to produce a red wine, "but the question came up about who would maintain the vines." Maite Mora Pamies, Sandra's mother, said she would! The family was working with bush vines, which not only produce better grapes than other vines grown in the area but also live longer as a result of this form of viticulture. Maite learned, and continues to use, the viticultural techniques of her father-in-law, which require two specific styles of grafting, one after pruning in March or April, and one in June. The grafting involves cutting the old vine off at ground level, slitting the root, and inserting the new vine in the slit. As a result, the graft benefits from the roots of the old vine, roots that may reach some 40' deep in the slate-based "soil." The techniques associated with this type of grafting make it a challenge even for experience viticulturists. The family received its first Parker rating in 1999 for its very first vintage, which was crafted by Sandra's parents and a consultant who was a family friend. The high rating was important in bringing the visibility that Mas Doix needed to effectively market its wines outside of Spain. Sandra was only fourteen years old when the family was making its decision to produce its own red wine. Watching her parents, who are her role models, "led her to love wine." From a young age, she participated in all aspects of the winemaking process with them, from the vineyards to the cellar. For her, winemaking was also a combination of chemistry and biology, the subjects she most loved. Sandra attended the Universitat Rovira i Virgili in Tarragona and completed her degree in enology in 2009. She then went to Spottswoode Winery in Napa for a four-month internship (Aug. to Nov. 2009). Sandra absolutely loved her work at Spottswoode and learned a great deal while at the winery. She still keeps in close contact with friends and associates she met there. Sandra had a second internship in Australia planned, but her parents needed her to come home after being in Napa: In 2008 the family had decided to increase the size of its facility to meet the global demand for its wine, and they needed her help. 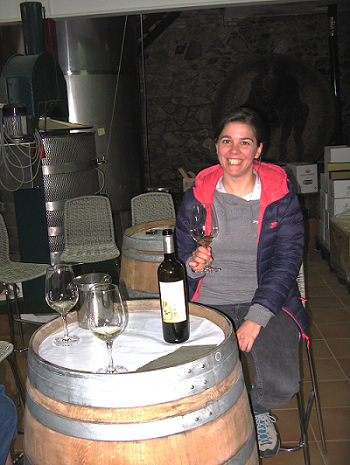 By 2010 Sandra was working at Mas Doix full-time as its winemaker. Sandra sees her work at Mas Doix as "preserving a way of life, a culture, and as a way to elaborate authentic wines that transmit the Priorat terroir." The entire family is involved in sharing in the multitude of winery and vineyard tasks. Everything in the vineyard is done by hand - "touch is essential," said Maite, and Sandra agreed. Their wines are made with minimal intervention and aged in French oak. Bottling is done without any fining or filtering and approximately 45,000 bottles are currently produced annually. Sandra's husband works elsewhere but assists with harvest and other activities, and loves being involved. When asked about the characteristics she would look for in a person she would hire, Sandra's response was "passion, patience with grapes, organized, and comfort with manual work, hard work, and having lots to do." If you had the necessary talent and ability, with the addition of creativity and enthusiasm, these same characteristics would well describe Sandra and Maite! Mas Doix wines, which have received national and international acclaim, include the 1902 Centenary Carignan, from the Carignan vines first planted by the family, Salangues, and 'Doix' Costers de Vinyes Velle. Les Crestes is their wonderfully fruity and expressive young Priorat wine, which is quite reasonable priced. We brought back a lovely bottle of 2010 Mas Doix 'Doix' Costers de Vinyes Velle and look forward to enjoying it in a few years. When it came time to decide what to study, she knew it had to be "outside work." Isabel Fortuny was born in the small village of El Catllar close to Tarragona - where she still lives - and grew up in a farming family. Her grandfather and father, and now mainly her younger brother, work the family farm, including growing olives and caring for its vineyards. When it came time to decide what to study, she knew it had to be "outside work." She decided on agricultural engineering and studied at Universitat Rovira i Virgili in Tarragona. When she finished her degree, she was too young to work as an engineer and so decided to study viticulture and enology. She found that she "really liked it." She worked for a short time in the lab of a large winery and then, in January 2003, went to Australia for an internship. She told us that her internship experience "confirmed that my passion is to make wine." This passion could definitely be felt throughout our conversation and visit! When Isabel returned from Australia in June 2003, she worked a harvest at Bodegas Torres. It was there that she met Raül Bobet, the person who has been an important teacher and mentor. Raül, who was at Bodega Torres for many years as a technical director, was involved in a new project, Ferrer-Bobet, close to the village of Porrera in the Priorat. He recruited Isabel for a position with the project, which she started in October 2003. Isabel now holds the title of Enóloga at Ferrer-Bobet. She has been involved in all aspects of the project's development, has been given increasingly more responsibility over the years, and loves the demanding nature of her work. Her background in agricultural engineering fits well with the winery's focus on strictly organic viticulture and respect for the biodiversity of the unique Priorat countryside. The winery's first vintage in 2005 used grapes from the hundred-year-old Carinyena (Carignan) and Garnatxa Negra (Grenache) vines. Additional vineyards were planted in 2004 with varietals such as Syrah and Cabernet Sauvignon as well as Carignan and Grenache, all of which are farmed organically. We were very impressed with the design of this very modern-looking winery, which uses gravity throughout the whole process of winemaking, from arrival of the fruit to bottling. We were shown the 10-kg harvesting crates used in the first step of vinification and the double sorting table used for rigorously selecting the grapes. Isabel finds that sorting is among the hardest aspect of the process to teach others! Her parents and four siblings live close to Porrera and often come by to visit or help, especially during harvest. Her father, in particular, is happy that Isabel is a winemaker, and is carrying on the family's love of vineyards. Understandably, he is very proud of her career path and her accomplishments. Isabel feels appreciated for her work and is very invested in the high standards set by the winery. Its wines consistently receive high ratings, such as the 93 points awarded by the Wine Enthusiast for the 2009 Selecció Especial Red. We had a lovely tasting in the winery's beautiful glass-walled tasting room overlooking the magnificent steeply hilled countryside and terraced vineyards. Both the 2012 Ferrer-Bobet Vinyes Velles and the 2011 Selecció Especial, which is from specially selected parcels, were impressive. The renewed interest in the Priorat gave her the future she had hoped for with her family's winery. The story of Sangenís i Vaqué, S.L.,starts in the 18th century with a family that produced wines. Fast forward to the 20th century, and to 1973, when Maria's parents, Conxita and Pere, married. 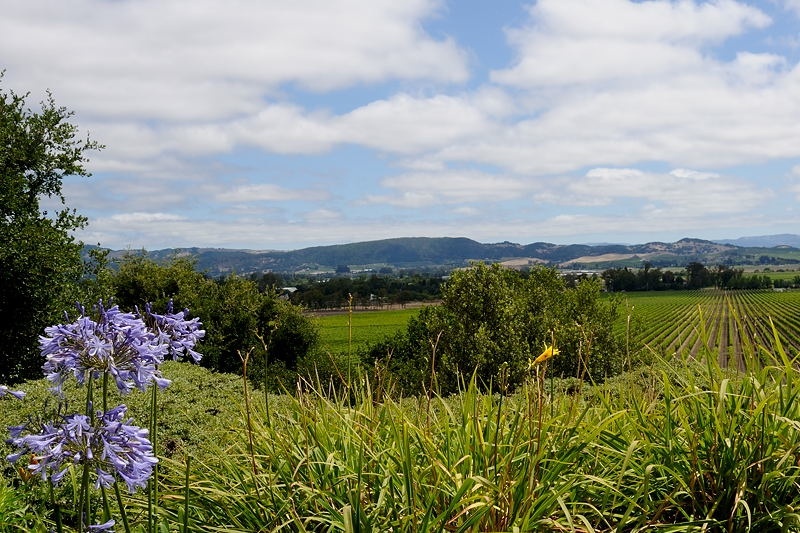 At that time, her mother inherited a winery and her father had a connection to the historic family vineyards. Five year later, Bodega Sangenís i Vaqué was founded. The family survived by selling its bulk wine and marketing other products such as olives and nuts that they produced. Until the resurgence of interest in the Priorat area, it was a very hard life for Maria's parents and their four daughters. Maria Sangenís i Vaqué, the second youngest of the four daughters, cared deeply about the family winery and what her parents were wanting to accomplish in the face of very difficult odds. The renewed interest in the Priorat was a gift of sorts as it meant that Maria could have a future in her family's winery! In 2000, Maria began five years of study at the university in Tarragona, in food engineering for the first three years and then in enology for the last two years. 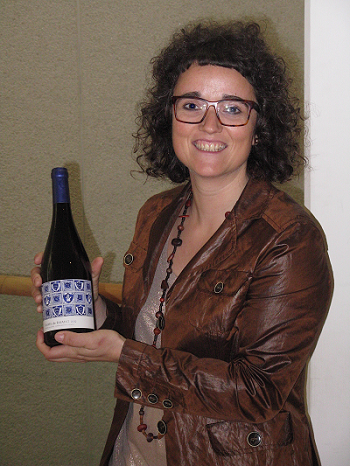 In 2006 she completed a practicum in Ribera del Duero and then began working with her father at the winery. He had revived the tradition of winemaking in the old cellar that belonged to Conxita's grandfather and had rebuilt parts of the winery in 2000. Maria said that she has learned as much, if not more, from her father than she did at the university. 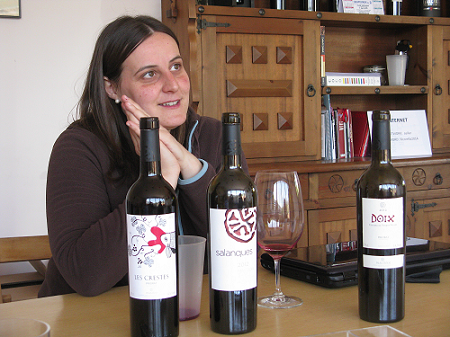 She is also well networked with the other young winemakers in the Priorat. Maria, who is soft-spoken and quietly radiant, is thrilled to be able to carry out the family's winemaking traditions. 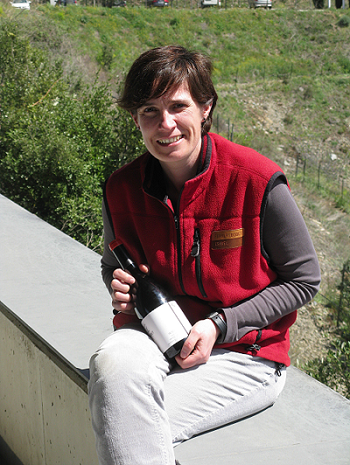 She is involved in all aspects of the winemaking and finds the work challenging and personally rewarding. She also has the added responsibility of being in charge of selling the wines! The winery is small but masterfully constructed by her father in order "to work smart" (e.g., they do not carry barrels in the cellar; different sections of the floor move for various winery activities). They farm organically and use only their own grapes from the family's old vines, which are hand picked. Sangenís i Vaqué produces some 25,000 bottles each year. Its wines are typically aged in French and American oak for 12 months. They are then bottled unfined and unfiltered, as we observed during our visit. As Maria explained, "this places their wines amongst the purest and most traditional." The winery's tasting room is totally unassuming and absolutely charming, as is the very talented Maria. We tasted many excellent wines, including their consistently highly rated Clos Monlleó, Coronya, and Val Por, and Maria's own project, the 2013 Lo Coster Blanc. For their Coronya, their Garnacha and Cariñena are blended 50:50, as they were historically. We brought back bottles of the 2001 Sangenís i Vaqué Coranya and the 2000 Clos Monlleó and look forward to enjoying them! She seamlessly blends the artistic with the scientific and the modern with the medieval. She led the analysis laboratory for the company for one year and then was asked to head up its Research & Development (R&D) and innovation areas. 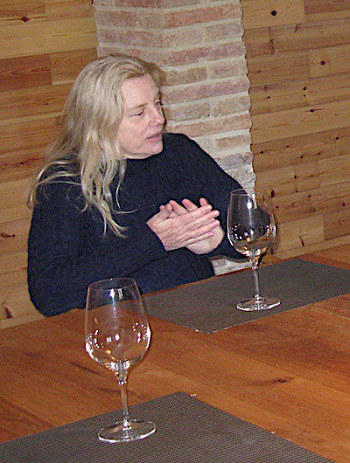 In 2004, she became Head of Winemaking of the company, and over the next six-year period led many successful projects in the areas of winemaking and viticulture, including the development of Torres Priorat, which had its first vintification in 2005 and moved to its own winery in 2008. Mireia who holds the title of Director of both Bodegas Jean Leon in Penedès and Torres Priorat, is an impressive winemaker and research scientist. We were able to visit both facilities during our visit. Doing so helped us to understand the breadth of her work and her passion for creating wines that are in balance with nature. Our discussions about Mireia's career path took place over lunch at Mas Rabell, the historic Catalan country house that has been in her family for many years. The food was wonderful of course, and the pairings with the Torres Priorat and Jean Leon wines excellent. What we most learned, having already read a great deal about the Torres family, was how likeable Mireia is! We talked about her wonderful children, her interest in psychology, and the goal we all have to live an authentic life. And naturally, we discussed wine. Torres Priorat and the Priorat wine region have a very special meaning for Mireia. She spoke quite poetically about the magic of the region, which we clearly understood when we visited Torres Priorat, located in the small village of El Lloar, a few days later. We were simply amazed by what Mireia was able to create there, where she led the development and implementation of the project. It is a state-of-the-art winery that seamlessly blends the artistic with the scientific and the modern with the medieval. Its solar panels provide a high percentage of the energy required for the facility. Mireia crafts two main award-winning wines here and a bottle of each, the 2012 Salmos and the 2012 Perpetual, made the trip back to California with us. A course in wine tasting, and winning a tasting competition decided her fate. Our last visit, with the energetic and talented Pilar Salillas, was briefer than we would have liked, as we were on the way to the airport in Madrid. Pilar holds the title of Enóloga at Bodega Raimat, a winery in the Codorníu Group. She began her studies in engineering and while completing this degree, took a course in wine tasting. She "fell in love with wine" at that point, and also won the competition associated with the course! From there, she studied viticulture at Universitat Rovira i Virgili in Tarragona, as did many other winemakers we spoke to in the region. She completed her praxis at Nuviana Cellar Valle del Cinca in Aragon, Spain, in 2006 and in 2007 headed off to Sonoma for an internship at Geyser Peak, where she worked in the cellar. On returning to Spain, she worked for several years at the family-run winery, CELLER PIÑOL in the Terra Alta wine region, and then one year in Raimat and two years at Masia Bach, which is in the Penedès, and part of the Codorníu Group. In 2013 she returned to Raimat, which is where she completed secondary school, and now lives in Binéfar, a short drive from the winery and close to where she grew up. Pilar loves her work and her increasing responsibilities. Her main work is in the cellar, overseeing the winemaking at Raimat. She has an excellent palate and greatly enjoys the tastings associated with the blending decisions at Raimat. In addition, she has been asked to coordinate safety, quality control, and environmental protection. Pilar feels supported and challenged in her work and looks forward to what the future will bring as her career progresses. She would love to become a technical director in any of the Codorníu wineries. She greatly admires the current technical director at Raimat, Elisabeth Figueras, who is an inspirational role model and visionary leader. We were very impressed by what we saw at the winery and learned a great deal about the dedication it has to sustainable agriculture. This includes solar energy and the careful use of water, which originates in the Pyrenees far to the north of the estate and is distributed throughout the extensive vineyards via a drip irrigation system that does not require the use of any pumps. Raimat produces both still wines and Cavas and was among the first wineries in Spain to produce a Chardonnay. Pilar introduced us to an amazing array of still wines as well as to the elegant new label for the Castell de Raimat Collection. We tasted several wines from this collection, including the 2014 Anima de Raimat, made from Chardonnay, Xarello and Albariño, and the 2011 Anima de Raimat Tinto, a blend of Cabernet Sauvignon, Tempranillo and Syrah, all of which were very enjoyable and also are quite affordable. We also especially liked the 2011 Cabernet Sauvignon and the 2012 Syrah. An Aside About Raimat. The history behind the Raimat Estate is interesting. In 1914, needing new land on which to plant vineyards, Manuel Raventós, son of Josep Raventós - who introduced the traditional method for making sparkling wine in Spain at Codorníu winery in the Penedès) - purchased a large block of land, which basically was a stone-covered desert 100 miles from Barcelona. Years of work transformed the area into what the Spanish government has called "a model agriculture estate" (Heckle, 2012). The size of the estate is somewhat mind-boggling, with nearly 4,000 acres of vineyards, all of which are certified by the Catalan Council for Sustainable Farming. Raimat constitutes virtually a single area within the Costers del Segre Denomination of Origin, established in 1986. Moreover, the village of Raimat itself is essentially a "company town," in that the vast majority of its inhabitants are employees of the estate. Similar to the U.S., increasing numbers of women in the three wine regions of Spain we visited are earning degrees in agronomy and enology. This particularly appeared to be the case in Catalonia where a number of the winemakers with whom we met were taking advantage of the excellent programs at its universities for studying winemaking. The Priorat appears unique among these regions, however. All the winemakers with whom we met talked about its uniqueness, not only as a challenging wine-growing area but also as a region of particular promise for women as viticulturists and winemakers. Wine regions experiencing growth, such as the Priorat, generally provide more opportunities for women than more established regions because more positions are available for which they can compete. In addition, as Daphne Glorian-Solomon noted, in Catalonia, women inherit the family estate and keep property ownership after marriage. Inheritance thus allows women a leadership role in agriculture not customary in other cultures. Similarly, others we talked with mentioned that in the Priorat it is more usual for women than for men to work the land and to be involved in making wine, and to be known for their persistence. Thus, compared to other areas of Spain and the U.S., the Priorat may be a particularly promising region for women in the wine industry, in general, and for viticulturists and winemakers, in particular. A number of the winemakers with whom we met also talked about the current atmosphere of "sharing information." Twenty years ago, people in the wine industry were described as "working with closed doors." Now winemakers and viticulturists share information and share a strong commitment to sustainability, organic viticulture, and respect for the biodiversity of the Priorat countryside. Perhaps this atmosphere of sharing is one indication of the greater presence of women and how their presence contributes positively and significantly to the current and future winemaking efforts in the Priorat. Let us toast these six awesome winemakers of the Priorat and wish them well! To quote Sandra Doix Mora, without exception, they see their work as "preserving a way of life, a culture, and as a way to elaborate authentic wines that transmit the Priorat terroir." 1Content for this article came from our conversations with the winemakers and information they provided us about their wineries and their wine region. Information about the history of Raimat came from A traveller's wine guide to Spain by Harold Heckle (2012) published by Interlink Books.